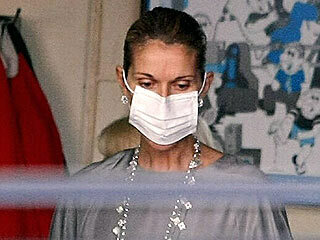 A masked Celine Dion in Australia March 26 Photo by: Newspix / Rex USA Her heart may go on – but the show will not. A throat infection has forced Celine Dion to cancel a string of shows in Australia, Reuters reported Friday. "Her doctor has instructed her to rest for an additional 48 hours in order to be fully recovered," publicists for Dion, 39, said in a statement. The infection had already forced the songstress to postpone shows in Melbourne and Brisbane. Now she’s also delaying her two concerts in Sydney and one in Perth. The multi-Grammy winner is in Australia as part of her first world tour in 10 years. The Canadian-born diva recently finished a nearly 5-year stint at Las Vegas’s Caesars Palace. Celine Dion - how much airbrushing?